An advertisement for Rudolph Ackermann’s Repository of Arts. Ackermann paid the master engraver J.S. Agar a substantial amount of money to produce the elaborately stipple-engraved masthead. The advertisement itself gives some indication of the range of different products Ackermann sold. Those of you who regularly follow the Cradled in Caricature blog will know that James Baker has been kind enough to make his images of the Ackermann ledgers at Coutts Bank available for public use under licence. Given that the opportunity to peruse the books of one of Georgian London’s most prestigious printsellers doesn’t come along every day, I decided to take up James’ offer and have spent the last two weeks slowly working my way through a portion of the ledgers and trying to make sense of the complex mass of information they contain. Now that I’ve finally finished transcribing a full twelve-months’ worth of data, I thought it was worth pausing in order to share a few initial thoughts on what this wonderful and unique source tells us about Rudolph Ackermann and the world he inhabited. The ledgers may contain a vast amount of data but it doesn’t take one long to realise that they still only provide us with a fragmentary and at times frustratingly opaque view of Ackermann’s business activities. For starters, the lack of detail on the origins of the money being deposited into the account means that the ledgers tell us far more about Ackermann’s costs than his his earnings. Our analysis of the outgoing payments is also complicated by the fact that creditors were often only identified by their surname and in some cases, such as the various Williams’ that appear in the ledgers, it is difficult to tell whether we are dealing with one individual or a number of people with the same name. What follows is therefore a far from complete picture of Ackermann’s publishing activities in a twelve month period straddling the years 1818 and 1819. It is fully open to reinterpretation and challenge and will no doubt be revised as further transcription work allows me to make more sense of the nature of Ackermann’s business. Once I’d finished copying out the relevant sections of the ledgers, I decided to cross-reference the names that appeared against the London Post Office Directory for 1819, the British Book Trade Index and the catalogue of the British Museum, in order to see how many entries referred to individuals that had some connection with Ackermann’s publishing activities. 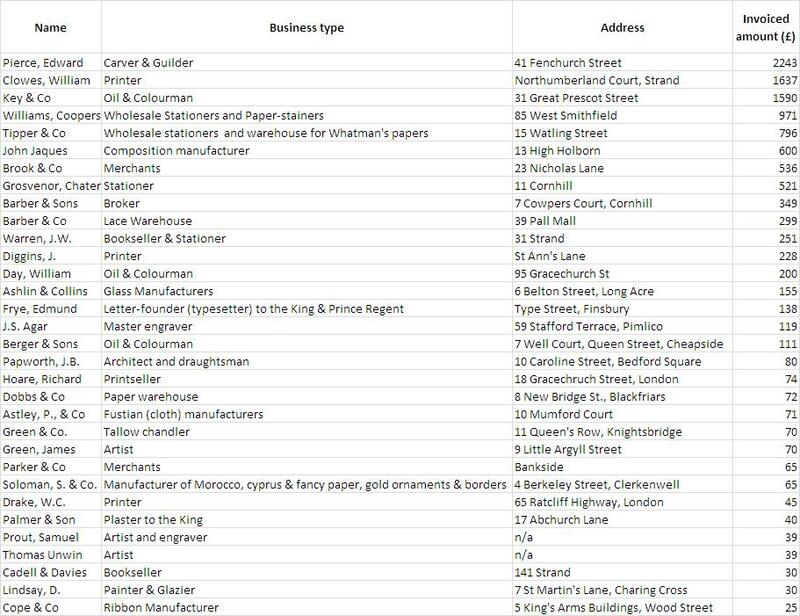 At the end of this process I was left with a list of 30 business addresses which I ran through Batchgeo and dropped on a modern map of London. One of the most surprising features of the map was the extent of the geographic area covered by Ackermann’s business contacts. My previous work on mapping the Georgian print trade had led me to believe that it was an industry that was firmly rooted in central London, whereas in fact elements of the trade stretched out into the suburbs and possibly beyond into the surrounding towns of Middlesex and Surrey. I had also speculated whether the apparent clustering of print-related businesses in the City and the West End had resulted in the creation of two disparate, or even competing, metropolitan publishing hubs which catered for different markets and had little interaction with each other. Examination of the ledgers now renders this theory completely redundant, as it reveals that the majority of Ackermann’s suppliers were located in the area between Cheapside and Fenchurch Street. In order to get a more detailed sense of the volume and nature of the business that Ackermann was engaged in with these firms, I sorted the digitised copy of the ledgers and calculated the total value of the payments made to each of Ackermann’s creditors between June 1818 and May 1819. The results were again surprising, indicating that Ackermann’s largest areas of expenditure were the payments he made to wholesale stationers, whose bills totalled £2,676 and oil and colourmen, who drew a total of £1,901 from the account. Publishing costs were another substantial overhead, with the engraver and printer William Clowes drawing a total of £1,637 from the account. Ackermann also appears to have spent a surprising amount of money on picture framing and indeed, if the Edward Pierce (or Peirce) whose name appears frequently in the ledgers is the same individual whot ran a framing and guilding business in Fenchurch Street, it may even have been the case that Ackermann’s framing costs exceeded his expenditure on stationery or paints. This money was presumably spent on framing the oils, watercolours and old masters drawings that Ackermann is known to have displayed and sold in the gallery space at the Repository of Arts. The ledgers also contain details of numerous small payments to plasterers, lace-makers, manufacturers of ‘fancy paper’, which reflect the variety of goods that Ackermann sold alongside his prints, books and stationery. Another intriguing feature of the data was the apparent lack of evidence of payments that were related to the process of printing. During the twelve month period under consideration, Ackermann made only a handful of sporadic and relatively small payments to businesses with some ancillary link to the print trade, such as typesetters, paper merchants and tallow chandlers. This seems to suggest that Ackermann’s in-house printing operations were relatively modest and that the majority of the material he published was in fact printed by a third parties such as William Clowes, W.C. Drake and J. Diggins. The names of several artists and engravers also appear in the ledgers and although none of these individuals has a verifiable link to graphic satire, the data still gives us an interesting insight into the relationships between those who made and sold prints. 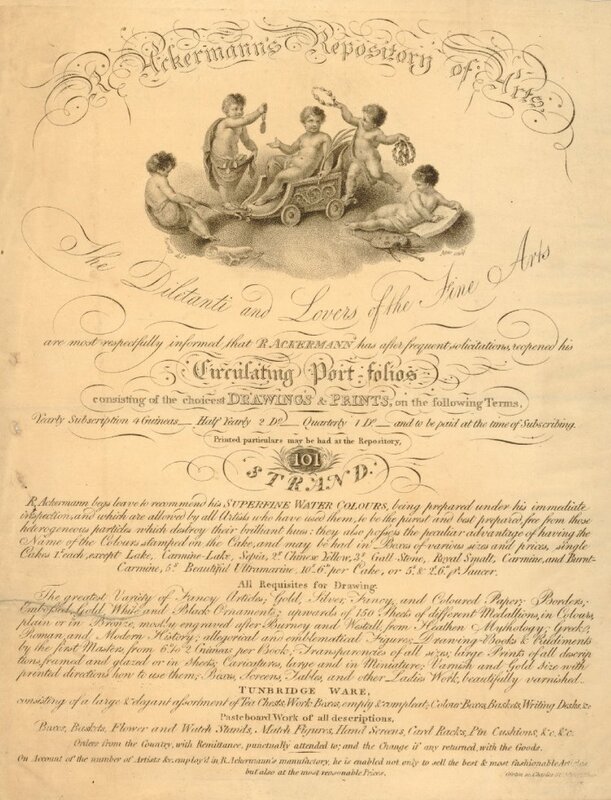 The illustrious stipple-engraver John Agar was the most highly paid of Ackermann’s employees, receiving a total of £119 for his work on a set of historical engravings and an advertisement for the Repository of Arts. After that comes the architectural draughtsman J.B. Papworth, who was paid £80 to provide plates for the book Rural Residences… and then the watercolourist James Green, who received a £70 royalty for allowing Ackermann to produced engraved copies of his paintings. Finally, there are the less well-known names of Thomas Unwins and Samuel Prout, who were each paid around £40 for producing multiple engraved images that were used to illustrate works such as the Complete Course on Lithography and Flowers: A Series of Studies from Nature Drawn on Stone. This suggests that the costs of hiring artists and engravers varied according to the reputation of the individual in question and the number of plates to be published. Master craftsmen like Agar could charge relatively large sums for producing a small number of images, whereas regular draughtsmen like Prout would be expected to engrave large numbers of images in exchange for much lower wages. Generally speaking though the ‘going rate’ for producing a series of illustrations for one of Ackermann’s publishing projects seems to have been about £40. The overall picture that emerges from the ledgers at this stage is one that seemingly challenges many of the conventional assumptions about Rudolph Ackermann and the world of the late Georgian print shop. Although Ackermann is chiefly remembered as a publisher and printseller, it’s clear that by far the largest proportion of his business was taken up with the more mundane business of selling stationery, art supplies and paintings. This inevitably leads us to wonder whether printselling was only a subsidiary part of a much larger trade in stationery and books and if businesses that dealt only in satirical prints, such as Hannah Humphrey’s, were in fact something of an oddity. The data also implies that printsellers may actually have had remarkably little direct involvement in the production of many of the prints they sold, with much of the actual printing and colouring of prints being carried out offsite by third party contractors. Once again it appears that the closer one looks at the trade in satirical prints, the more marginal and ephemeral it begins to appear. It will be interesting to see if this continues as I move through further editions of Ackermann’s ledgers in the coming weeks. 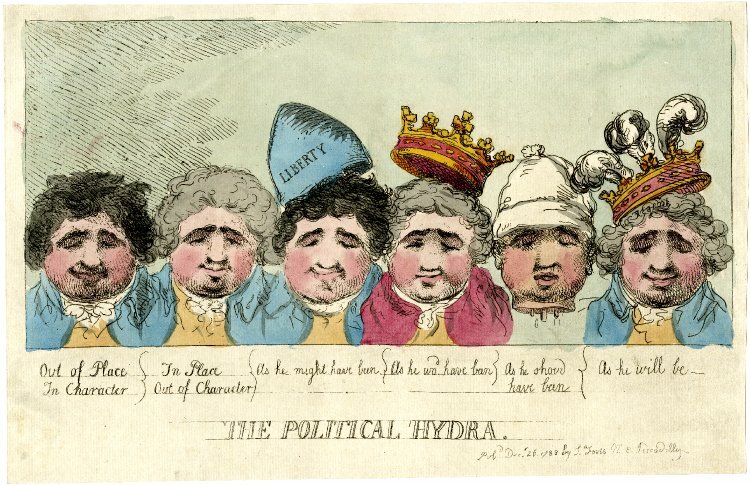 Thomas Rowlandson, The Political Hydra, 1806. 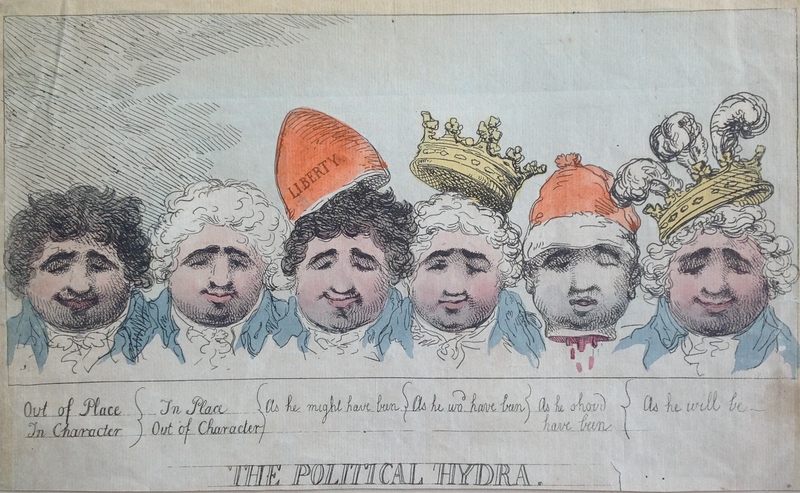 This copy of Thomas Rowlandson’s The Political Hydra is the latest item to find its way into The Printshop Window’s personal collection of Georgian caricature prints. The image was originally published in December 1788 by S.W. Fores and was one of a number of satires to appear around that time which dealt with Charles James Fox and the Whig’s role in the unfolding Regency Crisis. Fores then reissued the print eighteen years later, in April 1806, to coincide with the appointment of the Whig-led coalition government in which Fox was serving as Foreign Secretary. Unfortunately, as the publication line had been trimmed from this copy and as such I couldn’t tell whether my copy was one of the 1788 originals or part of the later edition that had been brought out in the nineteenth-century. I therefore decided to refer to the recently revamped online catalogue of the British Museum and see if I could try and date the print. 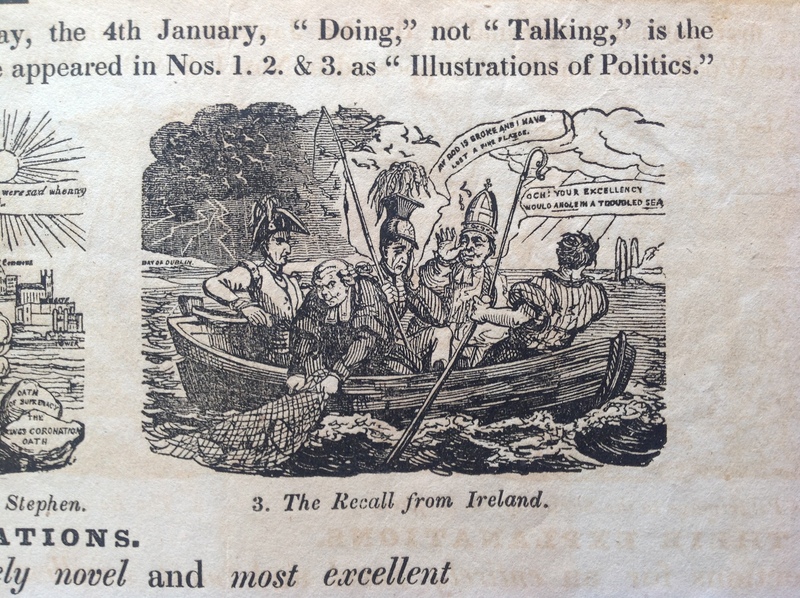 I found that the Museum actually holds four coloured copies of this caricature: two carrying the original 1788 publication line and two marked with the revised details for 1806. Comparing my print to the images on the Museum’s website, it quickly became clear that the colouring was exactly the same as that used on the two late prints from 1806 and that my copy of The Political Hydra was almost certainly a later re-strike. While looking through these images, I noticed that there were some significant variations in the way in which the different versions of the image had been coloured; with the two prints from 1788 differing both from each other and from the later editions. This got me thinking about the processes that may have been used to colour Georgian caricature prints and whether we can infer anything from these differences in colouring. While it’s perfectly easy to understand why the more collectable coloured prints dominate the surviving body of eighteenth-century caricatures, we shouldn’t assume that colouring was a default mode of production for Georgian printsellers. Colouring caricatures cost time and money and it’s unlikely that the tight profit margins of the publishing business would have allowed printsellers to carry large numbers of coloured prints in their stock. Indeed, the fact that the publication lines of so many printsellers states prices for both coloured and uncoloured copies of the design may indicate that prints were normally only coloured to order. The additional cost of colouring prints also means that they were unlikely to have been as common as uncoloured versions. The exact cost varied according to the printseller but in almost all cases it would appear that the price of a caricature would increase by anything from 50% to 100% once the customer had asked for it to be coloured. The fact that so few of London’s print shops appear to have employed colourists on a regular basis may also suggest that the production of coloured prints was not the norm. We know for example that Rudolph Ackermann, who was undoubtedly one of London’s larger and more successful publishers, would send bundles of prints out to the homes of his colourists and pay a set rate for each item that was returned in a satisfactory condition. If an arrangement such as this was standard across the print trade then it seems reasonable to assume that the demand for coloured prints was rarely sufficient to warrant the employment of a permanent colourist on staff. It also stands to reason that the number of colourists used would have increased in times of high demand and that therefore the notable differences in the tone and application of colouring may provide a very rough indication of the popularity of a particular print. 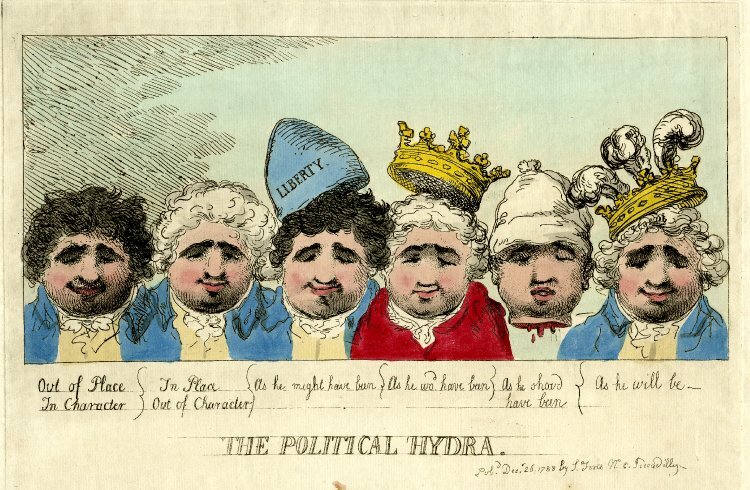 For example, if we return to our copies of The Political Hydra from 1788, we can clearly see that these prints were coloured by two individuals who, although working from a common set of instructions, were using different paints and had varying approaches to details like the colouring of Fox’s hair and the crowns. Conversely, if we compare my copy of the print with the two other 1806 editions held by the British Museum, the colouring is almost exactly the same. This may indicate that demand for this second edition was insufficiently high to warrant the employment of more than one colourist. Clearly, we need to test this theory out before jumping to any conclusions but a quick glance through the British Museum’s catalogue would certainly support the notion that some prints were more prone to variations in colouring than others. As such, I suspect that this is a subject that we will be revisiting again at some point in the future. The history of Georgian visual satire is one which has largely been written by art historians and those using caricature prints to explore the political and social history of the long eighteenth-century. The focus of historical study has therefore tended to fall upon the content and meaning of prints, as well as the motives of the men and women who produced them, rather than on the prints themselves as commercial objects. Consequently, we still know relatively little about the various industrial and commercial processes that surrounded the manufacture, sale and consumption of visual satire. The marketing of caricatures for example, is a subject which has eluded serious study and yet many of London’s publishers, printsellers and caricaturists were intimately bound up in the development of a burgeoning trade in print-based advertising. Topographic illustrations of London indicate that posters and advertising hoardings had become a ubiquitous feature of the metropolitan landscape by the end of the Walpolian era and the profits to be made from designing, engraving and publishing these advertisements provided London’s print shops and caricaturists with a vital subsidiary source of income. Inevitably, this creative and commercial overlap was to result in a gradual blurring of the boundaries between caricature and print-based advertising culture, with many prominent caricaturists introducing visual and linguistic elements of advertising into the lexicon of graphic satire. Notable examples of this include Hogarth’s copious use of mock billboards and signage in Southwark Fair (1733-4) and the correlation between George Cruikshank’s commercial engravings and the satirical work he would later produced for William Hone. 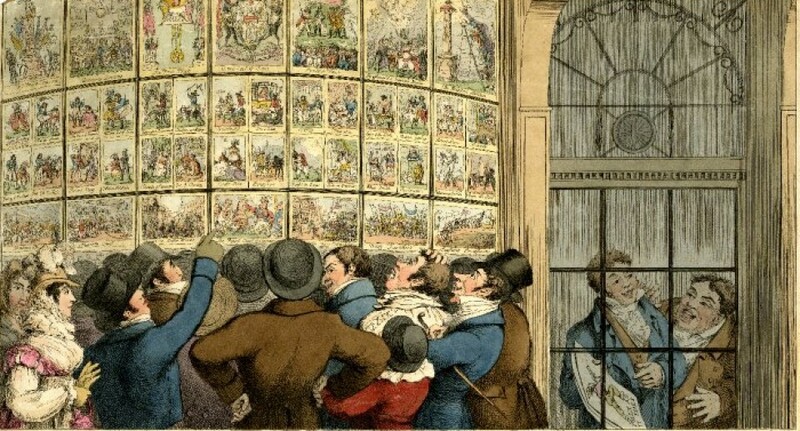 Unsurprisingly, given the degree of crossover between the two trades, printsellers themselves were often prolific and sophisticated users of advertising, with trade-cards, newspaper advertisements, handbills, elaborate hoardings and caricatures themselves, all being used as a means of drumming up publicity and announcing the arrival of new prints on the market. Unfortunately though, the ephemeral nature of many of these items means that they have subsequently been lost to history and surviving examples of printsellers advertisements are extremely rare. 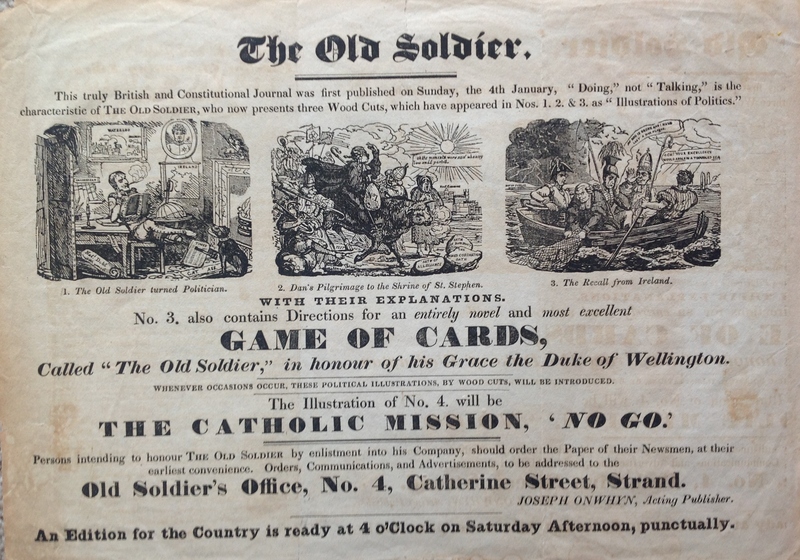 This advertisement for the satirical newspaper The Old Soldier was published for the print and bookseller Joseph Onwhyn in late January 1829. Onwhyn was a relatively marginal figure in London’s publishing world and what little we can determine about his life and the nature of his business has to be inferred from the surviving remnants of the material he published. Onwhyn’s publishing career seems to have begun during the turbulent years of the Peterloo era when he was one of a number of radically-inclined publishers who began turning out cheap copies of tracts such as Bryon’s Don Juan and Cartwright’s English Constitution. He is also known to have produced a least one satirical print on the government’s attempts to impeach Queen Caroline on a charge of adultery. By the late 1820s Onwhyn’s commercial interests had broadened to include the production of more mundane items such as fashion prints and travel books but political material still seems to have formed the core of his business and he continued to publish radical prints such as Picture of England at the close of the year 1826 her colonies, her manufacturers, her navy, her sailors, her crowded prisons, and her starving population, long after such items had ceased to be fashionable among London’s other mainstream printsellers. The fact that Onwhyn could afford to produce a run of illustrated advertisements suggests that his business must have been in relatively good health during the late 1820s. However, the low quality of the paper which the design has been printed on and Onwyhn’s decision to use the more economical form of woodcut engraving, clearly indicates that his was a business which was catering for a less affluent clientèle than that of West End rivals such as George Humphrey and Thomas McLean. The design itself contains influences from both contemporary advertising and the wider genre of graphic satire. 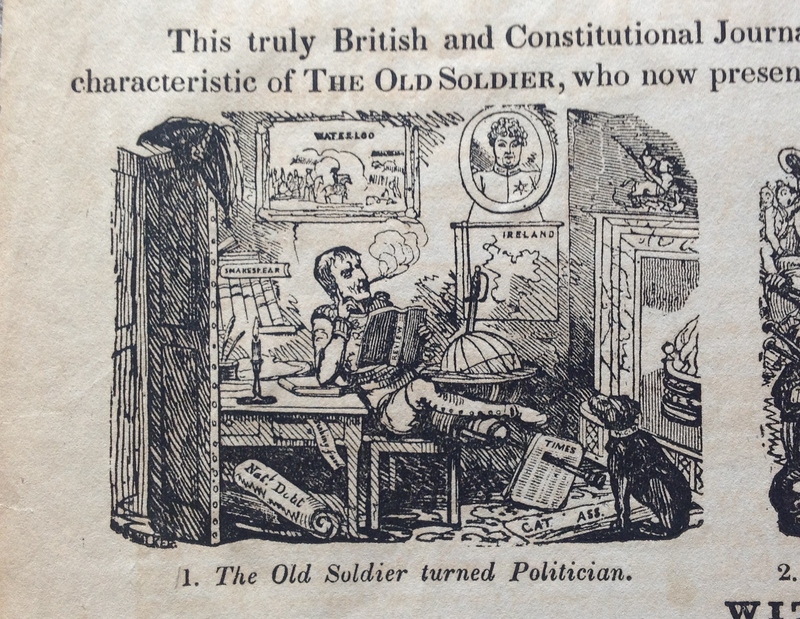 Onwhyn’s attempts to exhort his audience to ‘enroll in the Old Soldier’s Company’ by purchasing “this truly British and constitutional journal” can be read as a calculating satire upon the self-serving patriotism of the Tory presses and the military recruitment officer. 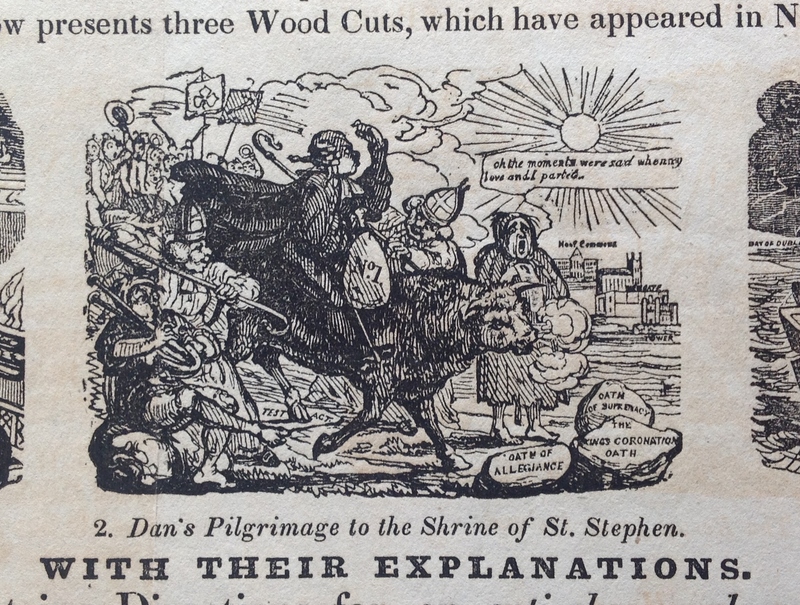 His decision to use woodblock-engraving for the caricatures may also have been a deliberate marketing ploy, designed to evoke images of the hugely successful series of woodcut-illustrated radical pamphlets which had been produced by William Hone and George Cruikshank a decade earlier. Indeed, there is a distinctly Cruikshankian air to the three illustrations which have been used to decorate the advertisement, although the presence of the initials “W.C.W” suggests that they were probably the work of W.C. Wise. Items such as this provide us with a fascinating insight into the wider business of making and selling satirical prints in the early nineteenth-century. They also serve to remind us that caricature prints did not exist in a creative and commercial vacuum and were in fact only a minor part of an increasingly diverse and sophisticated culture of print-based material. It turns out that when they’re not busy fixing interest rates, mis-selling spurious financial products and holding out their hands for multi-billion pound bailouts from the taxpayer, our friends in the banking industry also enjoy perusing Georgian caricature prints. The Bank of England Museum’s forthcoming Cartoons & Caricatures exhibition will chart the history of the Bank and England’s financial sector through a selection of prints and drawings from the Bank’s private archives. Anyone who happens to be in London between the 17th May and 9th November may wish to consider popping along in order to see original copies of Gillray’s A March to the Bank and Political Ravishment or The Old Lady of Threadneedle Street in Danger, as well as other works by George Cruikshank, John Tenniel and modern cartoonists like Gerald Scarfe and Steve Bell. Further details can be found on the Bank’s website. 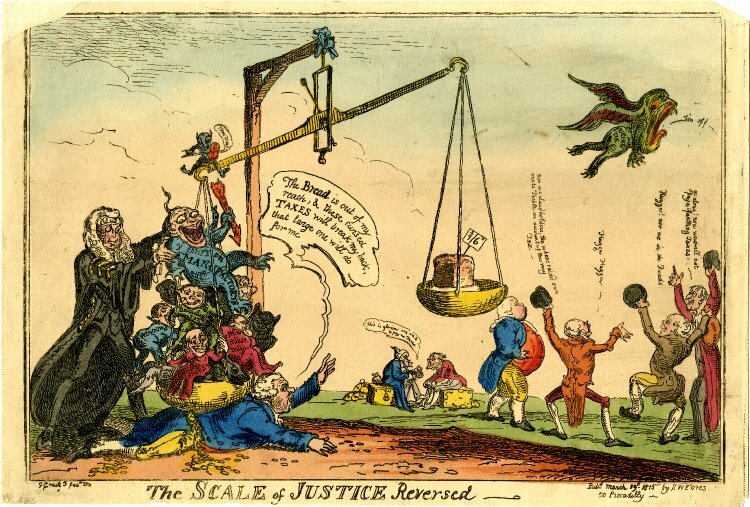 Regency banker-bashing: George Cruikshank’s The Scale of Justice Reversed, 1815. A starving and penniless John Bull is slowly crushed to death under the accumulated weight of the state’s debts, while a jubilant mob of bankers, landowners and merchants celebrates the repeal of the income tax. Gillray was an incredibly prolific artist and draughtsman. The auction of the final stock of Humphrey’s print shop in 1835 contained numerous lots consisting of sketchbooks, albums and bundles of loose papers; covered in drawings, notes and paintings. Many of these items have now disappeared and were probably destroyed as being of little interest to collectors. Consequently, examples of Gillray’s artwork are rare and a serious attempt to catalogue his drawings and paintings has yet to be undertaken. This album leaf was originally part of the famous collection of Gillray’s work which belonged to the American cartoonist Draper Hill. Hill sold off a large part of his collection back in 2001 and timed the sale to coincide with the launch of a major exhibition of Gillray’s work at the Tate in London. The popularity of the sale seems to have surprised everyone and in some cases resulted in prints selling for between five and ten times their original estimate. This watercolour was evidently purchased by an Italian collector and it’s recently surfaced again in a forthcoming sale in Florence. 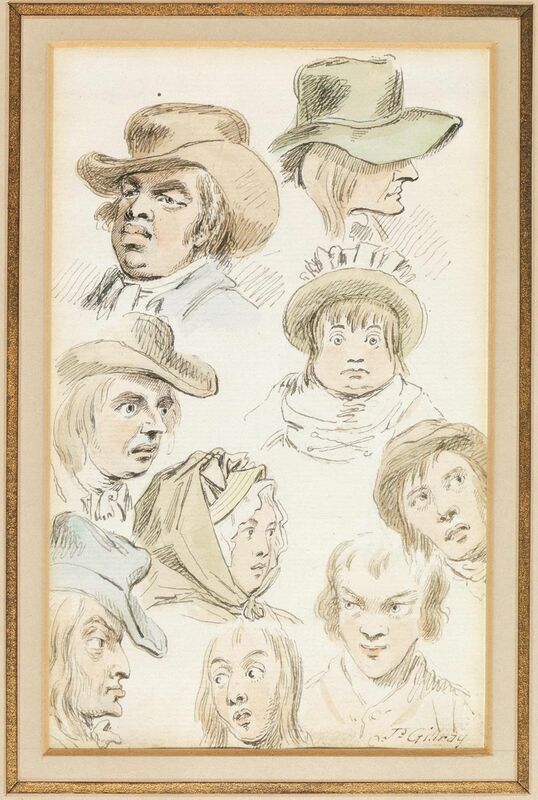 Gillray’s sketchbooks were full of these small portrait studies and it would appear as though some of them were used as the basis for more fully formed character studies, such as the pictures of the flower girl and the drunken barrow woman that appeared in the Tate exhibition catalogue. Other examples of Gillray’s artwork can be found in our archive. Please click here to link to the post.